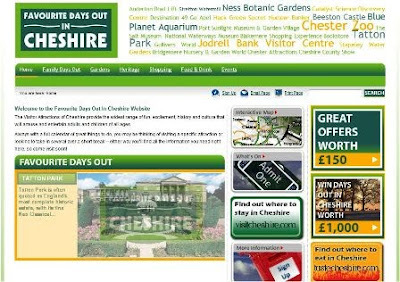 Last week saw the launch of another new iVisitor Guide website promoting the Favourite Days Out group of Visitor Attractions across Cheshire. This one site will give you lots of ideas for things to do when in Cheshire including family favourites such as the world famous Chester Zoo, historic Tatton Park, the botanic gardens at Ness or the out of this world experience at Jodrell Bank. The Visitor Attractions of Cheshire provide the widest range of fun, excitement, history and culture that will amuse and entertain adults and children of all ages. Always with a full calendar of great things to do, you may be thinking of visiting a specific attraction or looking to take in several over a short break – either way you’ll find all the information you need on the Favourite Days Out website! This site also links to Taste Cheshire, another iVisitor Guide website that promotes the best of food & drink available across Cheshire so if you want somewhere fabulous to eat we've got lots of fantastic options here. iVisitor Guide provides totally managed web development and maintenance services in conjunction with the regional tourist board Visit Chester & Cheshire.